Habitat: The plant is native to the cool climate of the Northern Hemisphere. Lily prefers well-drained, rich and sandy loams. 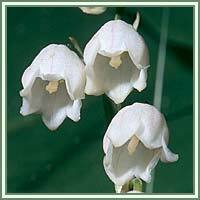 Description: Lily of the Valley is a herbaceous perrenial plant. It has a creeping rhizome, and a quill-like shoots emerging from a scaly sheath. Two glossy leaves are rising directly from the rhizome on long, narrowing foot-stalks, one leaf often larger than the other. Flower-stalk, usually leafless, has white, hanging, bell-shaped flowers. Flowering occurs from May to June. By September, the flowers are developed into scarlet berries. Parts used: Whole plant, collected while in flower and dried. Useful components: The plant contains two useful glucisdes, convallamarin and convallarin. 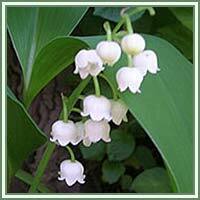 Medicinal use: Lily of the Valley is widely recognized as a cardiac tonic and diuretic. It is used in cases of valvular heart disease, cardiac debility and dropsy (it is usually recommended as a Digitalis substitute). It has strong diuretic properties, reducing blood volume and lowering blood pressure. It is also useful in treatment of chronic lung problems such as emphysema. A decoction of the flowers is useful in removing obstructions in the urinary canal, and it has been also recommended as a substitute for aloes, due to its purgative quality. Safety: The plant shouldn’t be used in combination with heart drugs called beta blockers and calcium channel blockers and lanoxin. Do not use the plant without consulting your doctor.